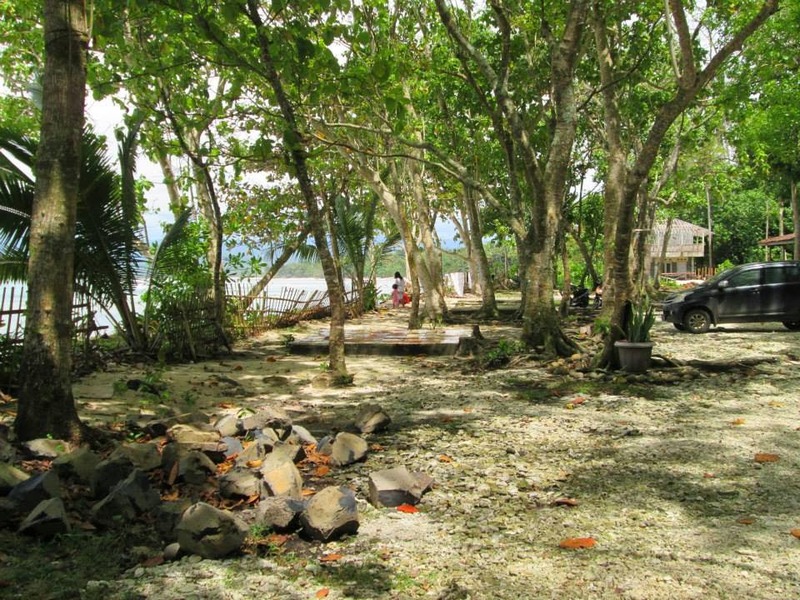 KRUI’s town beach is called Labuhan Jukung, where there are two concrete shelters with a low seawall running in front of the public area. In front and to the right for 300 meters, the sand is of high quality like Phuket Island. This beach ends at the Selalaw Headland, where there is a small lighthouse on top. For surfers, there are sandbar waves in front, and then Krui Right breaking a little bit off the headland; the current can be strange in the line-up area; it doesn’t break as often as Krui Left. From the public area to the left, Krui Left break into a channel where the small outrigger fishing boats (jukung) can go out into Teluk (bay) Krui. This is a fairly short good quality and consistent wave which need no wind or the Trade Wind (SE) in order to peel. When a Hawaiian scale 6-8 foot swell is running, Krui left will be getting 4 foot set waves with a picturesque line-up, though ideally it can’t really handle that many surfers. Labuhan Jukung has a good view. Walking on the beach away from town after the left, you start to circumscribe Ujung (headland) Walur. The sand from here is not as finely ground down and has plenty of pieces of shells and coral to step on, so if you are beach walking, you may want to wear beach sandals. From here around Ujung Walur to the Lintik parking lot on the other side of the headland (where Mandiri beach begins) is about a three-hour-walk. About 2 km past Krui Left, there is a small peak with a channel to the right for the Jukung’s. 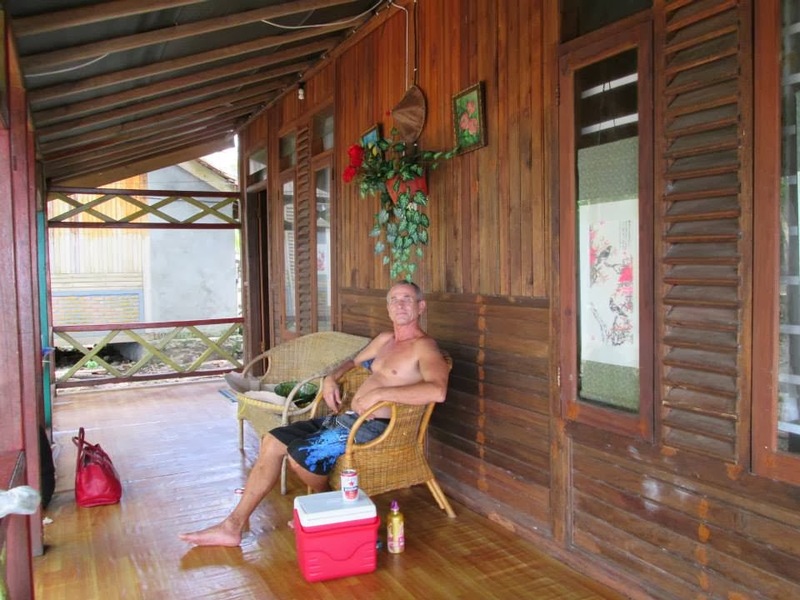 Here you can stop in for a ‘bintang besar’ beer at the shop close by, if you need a break. Not too far from here, the shore line trees have fallen onto the beach in many places, so even at low tide you have to go over these or out into the water if you want to keep going. Finally, you come out from this area as the shoreline of Ujung Walur bends around to the left. Now there are endless set waves breaking onto the edge of the fringing reef. Even if Krui Left is flat, the reef is white from the beach to it’s edge, so local fishermen are usually out on it, and then at low tide, many local people scour for different kinds of animal protein. Again, when a full-on 6-8 foot is going off the left breaking waves outside, combined with a late afternoon sun and some local casting their nets on top of the reef, form a classic Indonesian scene; it’s mesmerizing! There is no real line-up to the left breaking waves, and I haven’t heard of anyone going for it, because the waves break right onto the edge of the reef. Further on toward Lintik, Way (river) Redak form a narrow channel (keyhole) through the reef, and this may be rideable at times. Before the storm surf of February 2007, there was a kilometer of fine grained sand around Way Redak where you could lay in the shade of trees on the beach but this sand got washed away and hasn’t come back the last time I walked by. Following Way Redak inland, you can get on a dirt road that will take you back to Walur; the main N-S road. Walking this road, you can get a feel for what a huge headland Ujung Walur is. There is some troupes of Macaque monkies about along with healthy secondary growth of the original jungle (hutan asli). The whole headland seems to be self-sustainable in basic firewood for cooking. Bending around to the left after Way Redak, you come to Lintik parking area and the start of Mandiri beach. From the parking area to the main road is only a 10-15 minute walk vs. an hour walk using the Way Redak road. I’ve never seen the dodgy right point actually peel, but it’s a wave magnet if you’re hard-up; maybe it takes the rare west swell from a tropical storm out in the Indian ocean to make it work. At this spot, you can look across Teluk Mandiri to Karang Nyimbur to the South about 15 km away. 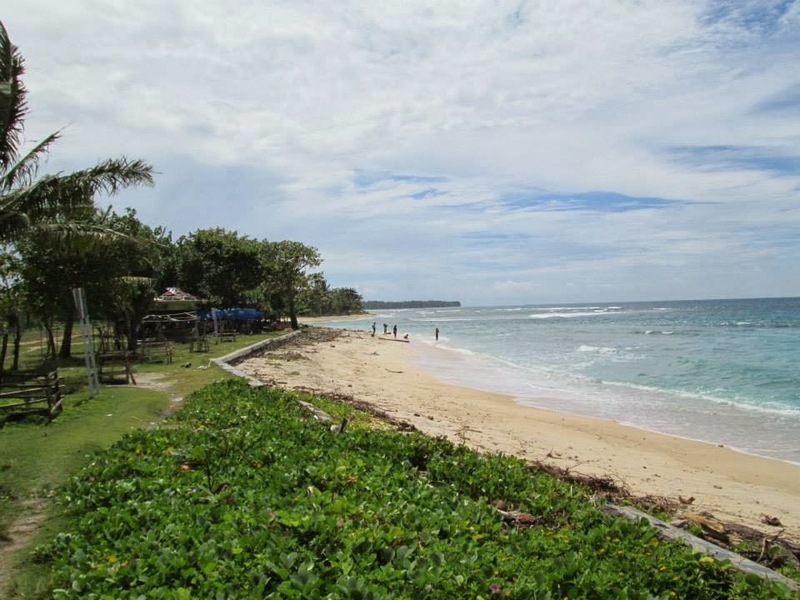 The sand of Pantai Mandiri is a mixture of mountain and ocean sand which has created a fine walking surface. 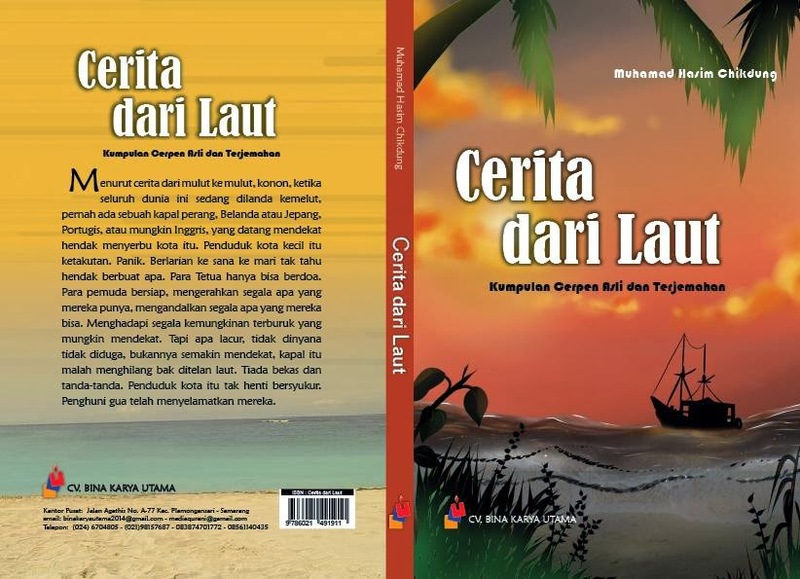 Because of it‘s dark color, the ocean water doesn’t look clear, but if you continue on past way Napal 2 km or so, and the waves aren’t too big, you can take a fine mandi laut (lolling in the gentle surf on the sandbar) in clear ocen water. The famous Jimmy’s Right north of Krui is known to hold 10 foot Hawaiian waves, but I seldom go up there, so I’m not sure about the swell direction it needs. 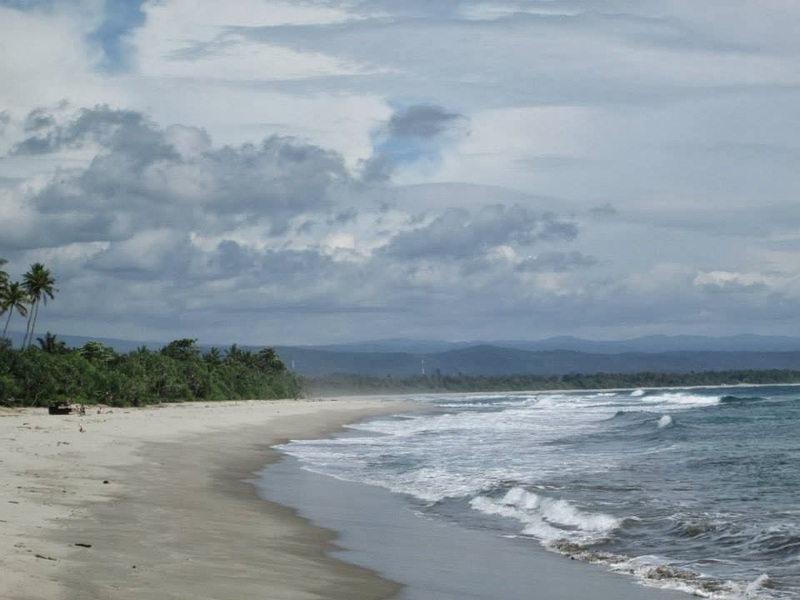 A minute walk past Way Napal brings you to the Mandiri Beach rest stop where there are two warungs and is popular spot for surfers to get a swell check and the local people to hang out for a while. Some places have just been built here for tourists to stay on the beachside of the road. There’s bound to be good reason why the local people don’t built right on the beach, but someone told me that the huge storm surf on February 2007 is only one every few decades. Past the Rest Stop, you soon come to the first of the three rivers; the middle one seldom break through to the ocean. Depending on the amount of rain in the Bukit Barisan (Frontal Mountain range), swell size, and the tide, all of river mouths can be dangerous; you’re on your own so use your best judgement and don’t worry about backtracking if you feel crossing the river is too dangerous. The third river is the most dangerous and twice I’ve gotten local guys to take me across in their dugout canoes (perahu). 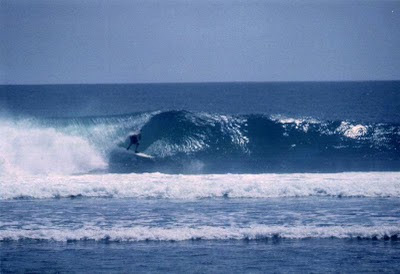 After this river before Bumi Agung is the area of the legendary A-Frames peaks out in the sandbar depending on the usual conditions. Access to this area is from a track that runs alongside the beach at the beginning (from Krui) of Bumi Agung. There is a warung right where the track begins. Coming into Bumi Agung, the sand is all from the ocean and further on into Karang Nyimbur (Reef of Flying Debris) there is again poeces of coral and shells on the sand. Tanjung Setia is at the Jukung area at the beginning of Karang Nyimbur and on calm days, there is OK snorkeling at the edge of the reef. I first came here February 2005 and stay in Karang Nyimbur. There is at least teens of surfer places to stay now. And the headland accommodation will continue growing for a while. Beside being a wave magnet, any wind is OK except for straight onshore. 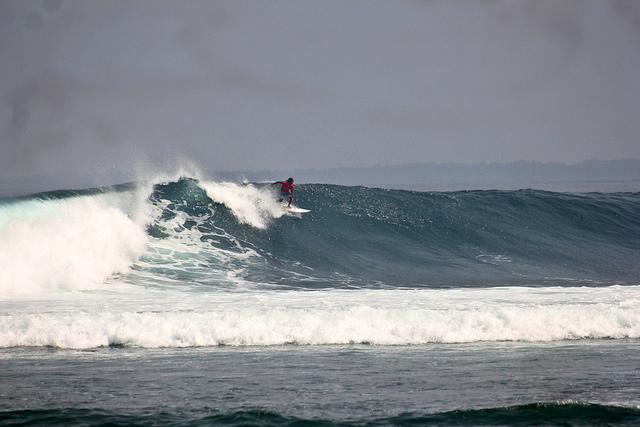 Overall 4-5 foot Hawaiian scale is when the surfing area is at its best. October is often a very good month along with the usual high season months of June, July, and August. I’ve made nine trips to Krui and have to stay periods of stormy weather are common from the end of October to the beginning of April. On the other hand, the weather can often be stable and clear in the middle of this period. All the various fickle breaks between the headlands need a calm or offshore wind; the trade winds seems to get here later than Bali and in general not be as solid. As I’ve walked the whole coastline from Labuhan Jukung to Belimbing where the west coast of Sumatera ends, there is too much details to write about (plus, I want to finish this article and get to the beach!) I’ll just finish up with some highlights of the coastline. A river mouth and Biha Beach separate Karang Nyimbur and Way Jambu; the other famous wave of this coastline. Clear water and sometimes epic lines make this a classic indo set-up. In general, it’s more fickle than K.N but I’ve heard it can get good for a few days at a time. South of Way Jambu Surf break is an epic stretch of beach for totally kicking back at low tide on the beach under some shade trees. This is maybe the top area for finding cowrie shells though they can pop up any where. 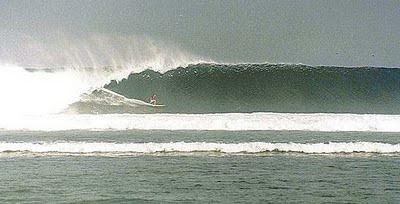 Way Jambu Kecil is a keyhole surf break that again on a real swell, is something to check out. Real Power Surf. And at low tide, the local are out on the reef. This whole area is high quality for beach bums. From Way Jambu Kecil, we enter the Pasar Senen beach where there is a reef break on small to medium days with very strange currents.